The 2160p upscaled 4K video is excellent and certainly worth the price. Details are sharp and black tones are deep and true. The tanker explosion towards the end of the film is amazing compared to the regular Blu-ray. The Equalizer began as a television series on CBS back in the late 1980's and starred Edward Woodward (The Wicker Man). It ran for four seasons and was nominated for numerous awards before being canceled. In 2014, Denzel Washington (Training Day) brought the character back to life in a feature film that garnered a following among fans and some critical praise as well. As the movie's sequel, Equalizer 2, opens in theaters nationwide, The Equalizer gets the 4K treatment in a terrific combo pack available in stores now. Robert McCall (Washington) is a simple man. He works at the big box hardware store and is liked by all of his coworkers. He is a man of routine. He gets up, goes to work, comes home, sleeps a little and then heads to the restaurant on the corner that is open all night. There he reads his book at the same table in the corner and sometimes converses with the young prostitute, Teri (Chloe Grace Moretz; Carrie), as she sits at the counter waiting for her next client. While he may seem a little odd or off in some way, no one knows the secret Robert keeps hidden below the surface. However, all that changed one day when Teri angers her Russian boss who beats her up and puts her in the hospital. Robert goes to him to try and buy Teri's freedom and when that doesn't work Robert suddenly unleashes a set of skills no one knew he possessed and proceeds to kill the Russian Boss and all his henchmen. This act, in turn, brings Teddy (Marton Csokas; The Amazing Spider-Man 2) to town to hunt down and kill Robert. Unfortunately, Robert is a highly trained former operative from some branch of the government and he eventually kills Teddy. Having used his skills for good, Robert decides to continue to help average, everyday people. Washington is a wonderful choice to play Robert because he exudes an air of calm but the audience can see the storm that brews underneath the surface. He also has the physical characteristics for the role and the precision of movement of someone who is OCD and happens to be a trained killer. Moretz has an intangible quality about her that makes her likable even as she plays a prostitute. Csokas makes Teddy completely unlikable and the look in his eyes is that of a psychopath. The 2160p upscaled 4K video is excellent and certainly worth the price. Details are sharp and black tones are deep and true. The tanker explosion towards the end of the film is amazing compared to the regular Blu-ray. The Dolby Atmos audio is exceptional, again sighting the tanker explosion as a "wall shaking" experience. The dialogue is clean and sits comfortably in the center channels while the sound effects take up the surrounding speakers. The Combo pack includes the 4K disc, the regular Blu-ray Disc, a Digital download and a number of extras. 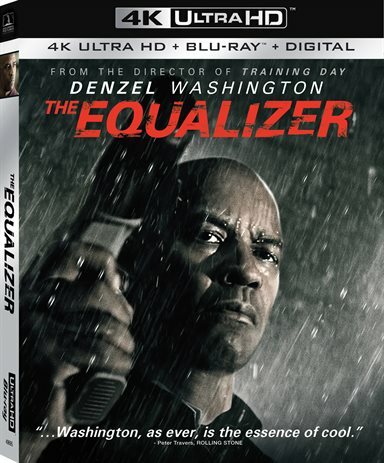 The extras on the 4K disc are: Deleted Scenes, A Villain's Psychosis, A Modern Hero, Joining Forces Again: Denzel Washington and Antoine Fuqua, Playing the Part: The Cast of The Equalizer, Boston: On Location, and The Home Mart Advantage: The Action of The Equalizer plus two Theatrical Trailers. Many of these extras are new and give some interesting insight into the making of the film. There are also previously released extras that are housed on the regular Blu-ray disc as well. There are a couple of scenes that are on the slow side and the action, while well-choreographed, is rather bloody. Having said that, the visuals are terrific and there are some great acting moments from both Washington and Moretz. This film is one worth owning, especially in the most advanced format. Download The Equalizer from the iTunes Store in Digial HD. For more information about The Equalizer visit the FlickDirect Movie Database.